Memory loss in elderly cats is not unusual. The aging process isn't exactly easy on anyone, and cats are certainly no exception. From the foggy vision to the hearing impairment to even the frustrating memory loss, felines often get the whole experience. Many elderly cats have feline cognitive dysfunction, which typically involves memory loss. Feline cognitive dysfunction is an ailment that's quite common in senior kitties, ages 10 and up. Signs of the condition include not only loss of memory, but also litter box problems, aggressive behavior, inactivity, anxiety, stress, sleeping a lot and loss of interest in favorite pastimes. If you notice telltale indicators of memory loss in your kitty, get help for her. Often, the earlier you see to the problem, the better the outcome. When a cat suffers from memory loss, in some ways her whole world is turned upside down. She may not know where her beloved scratching post is or the exact location of her food and water. She may also forget habits she's practiced her entire life, such as using the litter box. If your elderly cat's behavioral patterns seem "off," memory loss may be the culprit. Confusion is the name of the game when it comes to feline memory loss. If your cat randomly wanders off into different areas of your home -- and seems unable to find her way back -- it's probably because she's disoriented. Nothing seems familiar; everything is strange and confusing and, oddly enough, new. Your cat may get a blank look in her eyes and stare off into nothing. If she gets "lost" in your home and doesn't know what to do with herself, you may hear her vocalize loudly. She might meow or yowl to get help. Behavior changes in felines can also indicate memory loss. If your precious pet just doesn't seem like herself, take note. If she used to be very affectionate and cuddly with you, but now seems like she doesn't even recognize you, perhaps she really doesn't. Maybe she used to love checking out every nook and cranny in the house, but now hides away in the corner all day. She might even be neglecting her grooming duties. You can never be sure what's going on with a cat until you take her to the veterinarian. Schedule an appointment with the vet to determine whether your cat is indeed suffering from memory loss or perhaps another health condition. Many of the symptoms could overlap with those of other ailments, including kidney failure, diabetes and arthritis. If your cat does, in fact, have memory loss due to feline cognitive dysfunction, the vet may be able to offer some medication suggestions, such as selegiline (sold under the brand name Anipryl). Selegiline is a prescription oral medicine that's used to manage senility symptoms in both geriatric cats and dogs. If your cat's memory is going, you can help her stay as comfortable and happy as possible. Focus on creating stable, easy and predictable surroundings for your cat. If necessary, place litter boxes in several different rooms throughout your home. Keep your home's layout as unchanged as possible; for example, don't move your couch to another spot in the living room. Make dangerous and confusing areas inaccessible to your feline. If you don't want your cat to get lost in a dark and bewildering basement, shut the door and lock it. 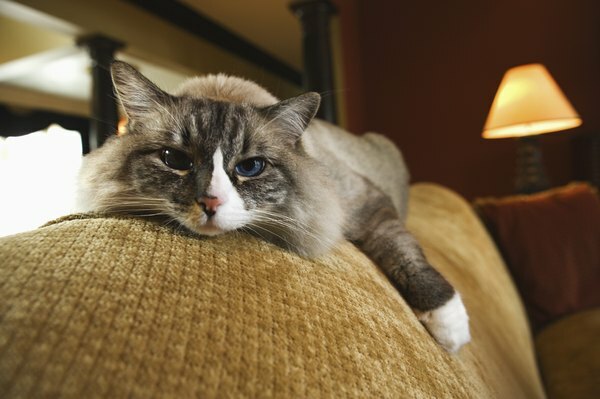 With some minor adjustments, your cat can remain happy -- and healthy -- in spite of her memory problems.